Custom rustic and contemporary dining tables that are truly unique with organic shapes, hand built out of large live edge, natural edge slabs. We also incorporate various types of steel into a variety of steel table bases and also use 2” thick clear acrylic for a more modern look. These are handcrafted one at time in our solar wood shop in Corvallis, Montana and shipped worldwide. We use recycled and salvaged hardwoods when we can, in an effort to be eco friendly. Many of the trees come from urban areas where there has been storm damage and the tree had to be removed for safety reasons. Our handmade live edge tables are constructed out of amazing hardwoods such as walnut, curly walnut, figured walnut, cherry, maple, sycamore, oak, elm, ash and many other unusual urban hardwoods not readily available but totally unique. Custom handmade dining tables that match your dining room area …. the right height, width and length…..made out of the right wood for your home or office. We have over 25 years of experience and are serious about handcrafting the right custom furniture for you. Please give us a call today at 406-777-3772 to inquire about a custom order or one of the many custom pieces we have in stock. 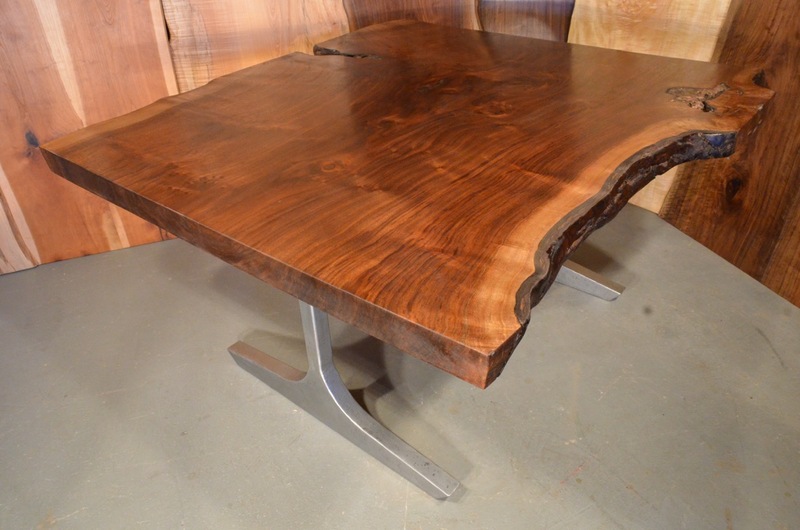 Approximately 9’ x4-5′ wide natural edge walnut crotch table now lives outside of Dallas, TX. I have another identical live edge top in stock to build another if you’d like. Shown with a set of handmade cantilevered chairs. 6×6’ Natural edge walnut custom dining table in a NYC penthouse apartment. Shown with live edge pedestal table base. 4×4’ Pennsylvania cherry table with hand carved edge and maple and cherry pedestal base. Many inlaid ebony butterflies in the table top. The wood came from a small mill in Lancaster County Pennsylvania. 7’ walnut natural edge table with 2” thick acrylic table legs now lives in Nashville, Tennessee. 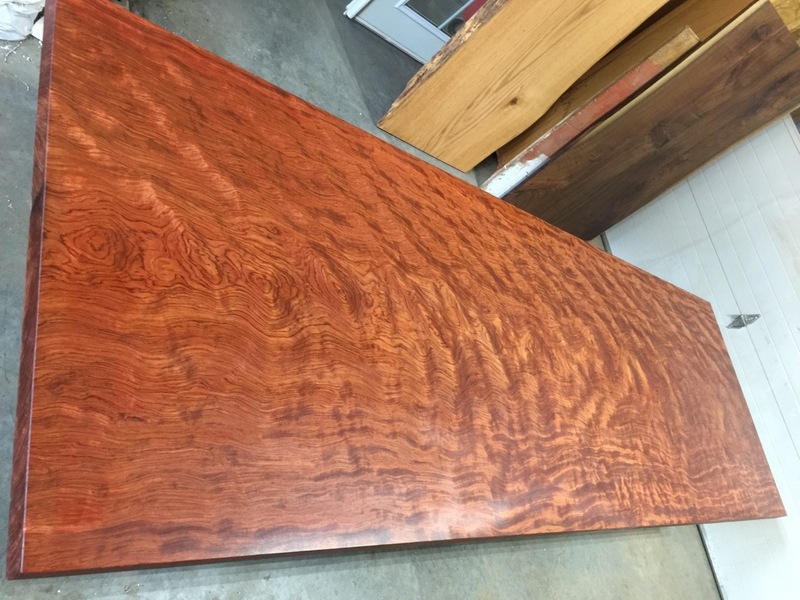 41” x 10’ long figured bubinga table top slab available with a variety of different legs. 6’ curly walnut top and angled walnut legs. I have many live edge tops in stock to choose from. 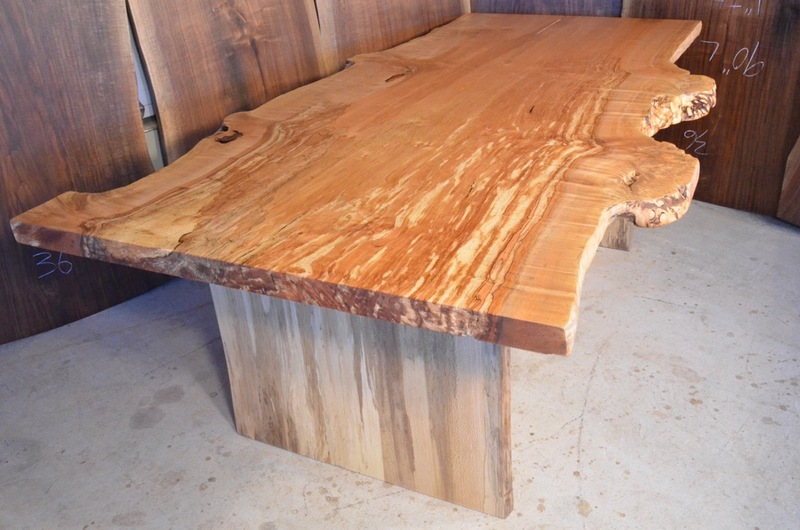 SPALTED MAPLE BURL TABLE TOP available with a variety of legs……..7’3″ L. x 2 1/4″ Th. x (49″, 48″ , 42″, 37″) W. I have a huge selection of natural edge tops, live edge tops and slab tops to choose from. 7’ Bookmatched maple crotch top with live edges and inlaid ebony butterflies. Repurposed metal from old Montana buildings on the legs. Approximately 5×5’ extra thick walnut live edge top from the end of a 16’ table slab that now lives in the Hampton’s. Custom steel legs.